Learn all about Tulip flowers in this gardener’s guide with a plant profile. Tulips are one of the most popular flowers and help signal the start of the spring season with their colorful blooms and variety of sizes. With an estimated 3 billion bulbs exported each year, depending on your color or size preference there is sure to be a tulip flower for you. A wonderful addition to any garden, tulips are low maintenance and offer spring color each season. In our tulip plant profile below, you’ll learn what sets tulips apart from other spring-blooming bulbs as well as basic plant care and where to buy them for yourself. History of tulips in Holland, and so much more! First, tulips announce the coming of spring. With their bluish-green leaves and tall, graceful form, what better way to wake up the garden than with brightly-colored tulips? In addition, tulips come in a variety of shapes, sizes, and colors. Did you know there are 14 different types of tulips to choose from? Plus, tulips are very low maintenance. So low maintenance, you might almost forget about them until they begin to burst out of the ground in early spring. Finally, we’re featuring the tulip because of it’s unique history, especially in Holland, where it was once used as a currency. Tulips are in the family Liliaceae and the genus Lilipa. This family group, also known as the Lily family, includes herbaceous and woody flowering plants ranging between garden favorites and wildflowers. With over 700 species, many members of this family are valued for their ornamental plants and highly commercialized through the flower farming industry, or floriculture, for their cut flowers and dry bulbs. Other members of the Liliaceae family include lilies, onions, garlic, and asparagus. Throughout the years, tulips have led to economic instability, huge commercial industries, and a “mania” all due to their perceived importance. Tulips have been cultivated since at least the tenth century. Wow! They have a long cultural tradition, particularly in the Islamic world, where they are highly symbolic and used for decoration among other things. Originating anywhere from Southern Europe to Central Asia, mainly Persia to Turkey, they were important to the art and culture of the Persian people and later the Ottoman Empire. By the 16th century, tulips reached Europe and were first seen in the Netherlands in 1625 but also continued to grow in importance to the Ottomans. Eventually, they became a national symbol of the Ottoman Empire and as the empire spread, so did tulip culture. Tulips actually became so expensive and economically important, they were used as a form of currency! As they continued their rapid spread across Europe, they made their way across the pond to America. Today, the Netherlands is the world’s largest producer of tulips with an estimated 3 billion bulbs (that’s billion) exported annually. Most tulips are loved and enjoyed around the world as spring garden staples and ornamental cut flowers. They differ by flower form, size, bloom time, and stem length. And of course, there are many different colors to choose from. Print Your FREE Tulip Plant Profile! 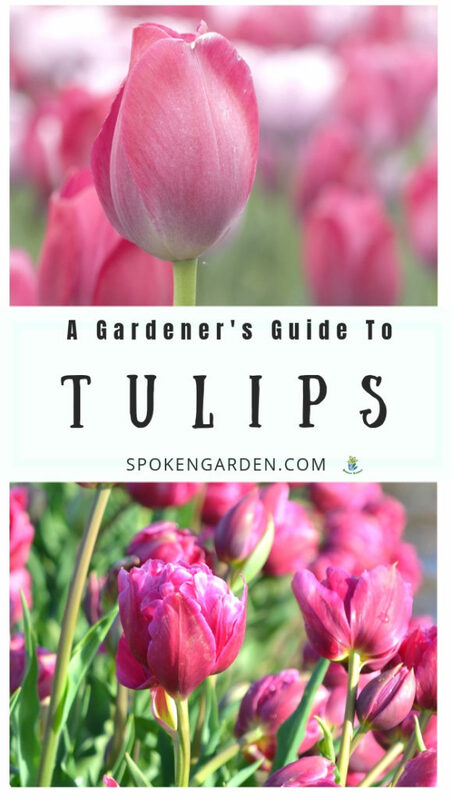 Subscribe to our Spoken Garden community and receive your FREE Tulip Plant Profile! Included in the plant profile: Tulip general plant info, maintenance tips, companion plants, and a planning guide! Zones USDA - hardy to zones 4 to 10; Sunset - grows in zones 1 to 24. General Information In the Liliaceae Family. Considered a "True bulb." Planting time will either be late summer or early fall depending on your zone. The more mild your location, the greater chance your tulip bulbs will need a cold treatment to begin their growth for that late winter or early spring. Native Environment Native to Central Asia and Turkey. Water Needs Regular watering is needed during growth and blooming. Once blooming has finished, not further watering is needed as bulbs go dormant over summer, fall, and winter months. Mature Height/Width Varies; can be from 6-inches up to 24+ inches in height. Bloom Time March to May. Flower Colors Flowers come in most colors and in different color combinations due to a mosaic virus (not harmful to plants) that gives different color patterns in flower petals. Sun Exposure Full sun up to and during blooming. Part shade in hotter climates after blooming. Growth Habit Upright; single stem with leaves radiating oppositely and having one flower per stem. Soil Needs A rich, sandy soil is best, but most tulips will grow in any well-draining soil. If planting new tulip bulbs where older ones have been or were growing, then either plant new bulbs in different location or replace old soil in that old location. Fertilize Fertilize plants before blooming with Nitrogen formulation. Plant Spacing Depends on bulb size. Need to plant each bulb twice as deep as the bulb is wide. Bulb spacing can be type-dependent, but a good rule of them is at least 4-6 inches for miniatures and smaller types, and up to 8-12 inches for larger plants types. Maintenance Level Low to minimal maintenance. Only after planting will there be any need for some maintenance when done flowering, the leaves and stems will wither to the ground where they will then need removal. Maybe some digging and spreading of bulbs in later years. Pest Susceptibility Susceptible to soil digging pests such as Gophers or Moles, Squirrels, and Voles. Also susceptible to Aphids. Poisonous to Pets? According to the ASPCA, Tulips are toxic to cats, dogs, and horses. The bulb itself contains specific chemicals that make animals sick, so don't let your pets or animals eat any part of the bulb. Edible for Humans? Tulips aren't poisonous to most humans, but some sensitive individuals need to not touch or ingest any part of the plant or bulb which can cause skin irritation or indigestion or worse. Fun (or historical) Facts - At one point in history, tulips were the most expensive flower and led to economic instability. - Different colors of tulips symbolize different things. - About 3 billion tulips are exported from the Netherlands annually. - "Tulip Mania" happened in the 1600s in the Netherlands and tulips were used as currency. A financial bubble occurred and eventually what many consider the first economic crash. - The name "tulip" originated from the Persian word "delband," meaning turban. - In the 1980s, striped tulips were outlawed by the Dutch government because they were thought to weaken other bulbs. First of all, bulbs should be planted in the fall before the threat of the first frost. The month may vary depending on where you live. Next, when you select your tulips, consider their flowering times, their suitability for borders, or containers. Finally, select your bulbs carefully and only plant healthy bulbs. Inspect bulbs for moldy areas or other signs of damage before planting them in the ground. After they have flowered, wait until the tulip flower, stem, and leaves have fully withered and turned brown before cutting the flower off. This will make sure the bulbs get all the nutrients from these plant tissues they need for next season’s growth. Also, you can cover the bulb area with 2-3 inches of mulch to keep it protected, healthy, and warm during the off-season. One of the greatest displays of tulips in the world takes place each April in the Skagit Valley. Known as the Tulip Festival, tulips of various shapes, sizes, and colors grace the landscape and dazzle each spring. Check out this quick video to see for yourself! Should you buy your tulips as bulbs or already grown and potted from the store? Well, do you prefer to wait a bit or do you want instant gratification? There are benefits to either, so it really just depends on your preference. Now it’s time to pick out your own tulip bulbs to plant next fall or live tulips to place in your home now! The best part is there are so many beautiful colors, shapes, and sizes available. Below, we have both bulbs and live tulip plants for you to choose from depending on the color you prefer. The gorgeous selection of bulbs come from Eden Brothers which we recommend. The bulbs are on pre-sale now and will ship in Fall 2019. Our beautiful selection of live tulips come from Amazon and are all prime shipping so you can receive them quickly! Or, if you need to shop for other garden plants for this spring, click the link below. Click here for the most up to date deals and plants on Amazon! Tulips are one of the most popular flowers and help signal the start of Spring season with their colorful blooms and variety of sizes. Depending on your color or size preference, there is sure to be a tulip variety for you. A wonderful addition to any garden, tulips are low maintenance and offer spring color each season. What color tulip do you want to plant in your own garden? Which variety are you interested in? Leave a quick comment below and let us know! Thanks for reading and we hope you enjoyed our tulip plant profile. Click the graphic above to save “Tulip plant profile” to Pinterest for later! All about spring tulips in this gardener’s guide and profile of this beautiful plant.